I finished another book! Shocking. This is my lowest book month in recent memory – 3 books completed in September. Sigh. I’m telling you – it’s not the baby, it’s the job. And now to the book – The Age of Miracles by Karen Thompson Walker. First off, I have to say that I rarely read sci-fi, dystopia, speculative fiction or YA. I have read a number of reviews of The Age of Miracles that criticize it for not holding its own in one or more of those categories. I can’t really address that criticism, because I am not familiar enough with those genres to judge. But I will say that I loved this book. The Age of Miracles, which has gotten a great deal of attention this summer, is about the year when the earth’s rotation slowed down. The story is told through the eyes of an 11-year old girl named Julia who lives with her parents in southern California. With the slowdown comes a legion of problems for humans living on earth. The days start to get longer, throwing off the natural rhythm of life and confusing the calendar. Then birds start dying, unable to fly due to changes in the gravitational pull of the earth. Fruit can no longer be grown due to the changing pattern of daylight hours; whales are beached all along the coasts; and so on. Julia’s life is affected by these changes, just as everyone’s are, but at the same time she’s also a middle school girl trying to navigate the treacherous waters of fickle friendships, boys, and parents with their own problems. The Age of Miracles (so named because adolescence is often called the age of miracles) is one of the most creative books I’ve ever read. 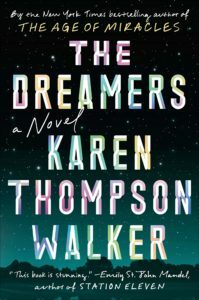 Walker’s depiction of the gradual changes brought on by the slowdown, and the ways in which people reacted to those changes, was both realistic and totally original. There’s no revolution or apocalypse; there’s just ordinary people either trying to deny what is happening, or overreacting, or turning on each other because they don’t agree with how to adapt to the changing reality of a new way of life. Julia is a matter-of-fact, minimalistic narrator whose small, personal life is just as important to her as the cosmic changes taking place around her. I found The Age of Miracles quite stressful to read, as I suppose many dystopian novels must be. Yet Walker’s artful prose and the poignancy of her story kept me going despite the difficulty of the subject matter. My one complaint is that there was too much needless foreshadowing; she often ended chapters with sentences like “We had no idea how bad it would get later” or “It was the last time I would ever be in her house” or “We would later learn that…”. I find that kind of foreshadowing a bit cheap and patronizing. If a story is strong (as this one was), then I don’t need that type of hinting at what’s to come in order to keep me interested. I’d rather be surprised. This is a minor complaint, but it happened enough throughout the book that it’s worth mentioning. One other quibble: there were few mentions of how countries other than the U.S. were faring on the new earth. I’d like to have learned more about what was happening in other parts of the world. When I first read about The Age of Miracles, I wasn’t interested in reading it. But I ended up getting it from the library and decided to take a chance on it, and boy am I glad I did. What a creative, thoughtful novel. I highly recommend it.